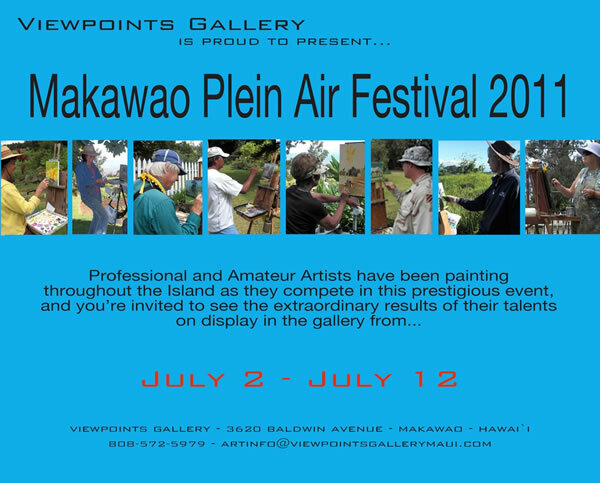 Two of Ellen's pieces are featured in the Viewpoint Gallery's 2011 Makawao Plein Air Festival. The exhibit runs from July 2 through July 12. Below, Ellen is seen posing in front of her work. 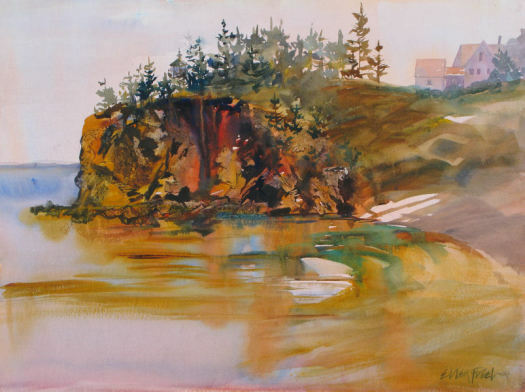 Ellen Friel has achieved signature membership in The New England Watercolor Society. She will be inducted at the annual meeting in March 2011. She is also a signature member of The Copley Society of Art/Boston, and a juried member of The Sharon Arts Center, The Cambridge Art Association, and The New Hampshire Art Association. From September 24 through October 24, The New England Watercolor Society is holding their 12th National Biennial Open Show at The North Shore Arts Association, 11 Pirates Lane, Gloucester, Massachusetts. Adjudicator John Salminen chose 91 works from 548 submitted from all over the country. 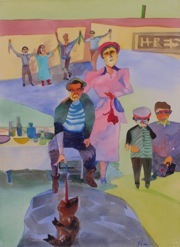 "Easter Pig", a figurative painting, was among the 91 paintings chosen. You can view all of the paintings in this show by going to the NEWS web site. In Gloucester, MA from September 24 through October 24, the New England Watercolor Society's 12th Annual North American Biennial Open Show will be held at the North Shore Arts Association. Easter Pig91 works, chosen from 558 submitted watercolors from all over the US, have been compiled by juror John Salminen to represent the varied methods and techniques used to create a watercolor painting. Mr. Salminen is a signature member of many art groups, including NWS, AWS (Dolphin Fellow), and Transparent Watercolor Society of America (Master). A special opening reception and awards ceremony will take place on October 3, from 1:30 - 3:30. Refreshments will be served. The gallery is handicapped accessible and situated on Pirate's Cove Lane in Gloucester, MA, on the shores of historic Gloucester Harbor. Gallery hours are Monday - Saturday 10 am - 5 pm and Sunday 12 pm - 5 pm. The New England Watercolor Society is one of the oldest regional artist groups devoted solely to the art of watercolor painting. October 9 - Gallery Talk, Judy Metcalfe, 2 pm. October 10 - Demo, Frank Costantino, 2 pm - 4 pm. October 17 - Demo, Robert Noreika, 2 pm - 4 pm. Traditionally, a Greek Easter features lamb, but I did this painting based on a family joke. All of the people in the painting are my relatives. We have many fond memories connected with this time of year. The painting is 22" x 30" and is done with transparent watercolor. The works can also be viewed online through the New England Watercolor Society's web site. 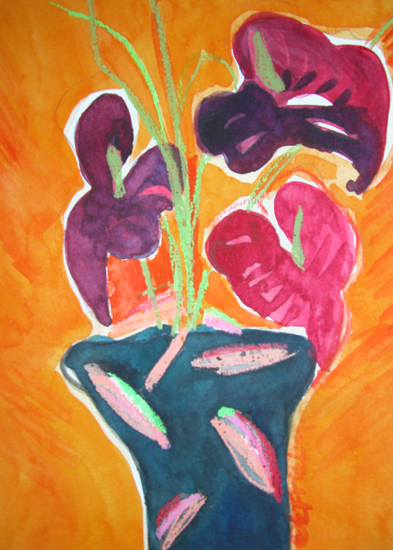 The Copley Society is currently exhibiting three of Ellen's small watercolor works, all of which are 12" x 12" or less. Ellen's Irises series will be featured as part of the Jaffrey Chamber of Commerce's Monadnock Arts Auction in early February of 2009. Ellen is the Featured Artist for the month of January at Sharon Arts Center in Peterborough. Her work will be exhibited in the Sharon Arts Center's Colonnade Gallery. The opening reception will be Friday, January 16, from 5 - 7 pm. Ellen's floral work will be featured in the Copley Society's exhibit, ECHO, from January 9 through March 1, 2009. Ellen's work will be exhibited at the Sharon Arts Center's Peterborough Gallery as part of its show The Gift of Art. The Preview Reception will be Friday, December 5, from 5 pm to 7 pm. Ellen's work is included in a current exhibit, entitled Close to Home, at Art 3 Gallery in Manchester, NH.